A New Jersey creamery is taking inspiration from a flavor much revered in the state but not so much in the ice cream world: pork roll. Windy Brow Farms, a dairy farm in Fredon Township in Sussex County, revealed the first-ever Taylor ham ice cream, launching the first of its “Only in Jersey” ice cream collection. Because ice cream simply flavored like pork roll would be “gross,” at least according to Windy Brow managing partner Jake Hunt, he sweetened the deal by adding maple and French toast to the creation. For each 2.5 gallon container of the ice cream, there are about two pounds of Taylor ham. 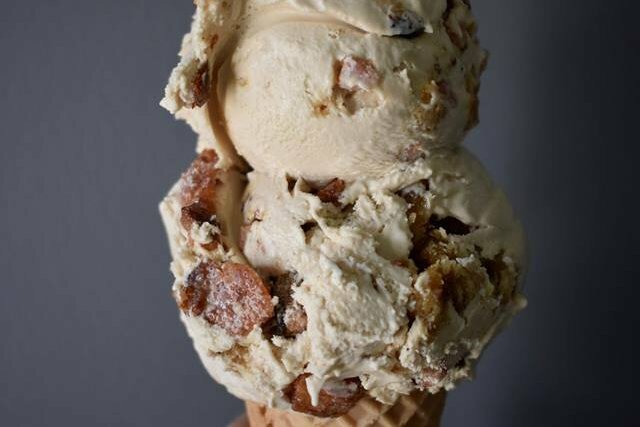 According to NJ.com, the ice cream is made by first caramelizing Taylor pork roll and placing it in the oven before pan-frying it. The ham is then coated with cinnamon and sugar while maple syrup and pieces of challah bread act as the French-toast portion. Additional ice cream flavors that err on the adventurous side are on the way. Four more flavors will join the “Only in Jersey” collection, including blueberry, sweet corn, and… tomato pie. So there’s that. Flavors will be introduced every few weeks throughout the summer.